Positive Letters .... inspirational stories ....: Ever Thought of a Map as an Encyclopedia? Ever Thought of a Map as an Encyclopedia? 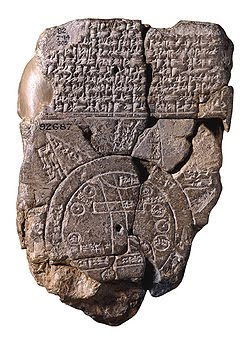 Early world maps on clay tablets were known to exist drawn to reflect the depiction of the age, as shown in the Babylonian world maps .. even then they showed seven islands arranged around so as to form a seven-pointed star, with several cities, but the whole surrounded by a “bitter river” (Oceanus). The ancient civilisations all produced pictures that today we would describe as maps, especially once they have been reconstructed, .. sometimes very complicated affairs reflecting the world as they knew it, and life as they predicted, their philosophy and mythology, but all the while incorporating the new ideas of their era. 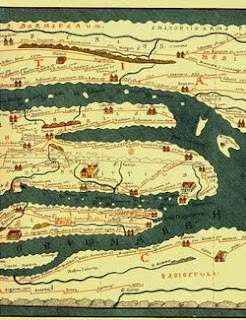 The Romans left us a plan of Rome and the first road map of the world (Itinerarium Scriptum) (literally written itinerary), which would make sense as their maps seem to have met the practical requirements of political administration and of military undertakings. The 13th C copy (an almost true reproduction of the original) is today known as the Tabula Peutingeriana is an itinerarium showing the cursus publicus – the public roads from Iberia in the West to India in the East - and is conserved in Vienna. Mappa Mundi is a general term used to describe medieval European maps of the world. Approximately 1,100 mappae mundi have survived. Ranging in size and complexity, of which some 900 are to be found illustrating manuscripts, with the remainder existing as stand-alone documents. The term ‘mappa mundi’ derives from the Medieval Latin words for ‘cloth or chart’ and of the world’. Developing a brand can be about your passion, which is then expressed in the title you choose and that definitely occurred in this publishing niche – The Folio Society. It was conceived after the war to produce ‘a poor man’s fine edition’ – a well-designed, printed and bound book to which the common man could aspire. Since then it has produced a number of ‘Folio Fine Editions’, subsequently introducing a series of deluxe, limited edition publications at substantially higher prices, often facsimiles published in conjunction with The British Library. Their latest idea is a new letterpress limited-edition of Shakespeare’s plays .. and this where the Hereford Mappa Mundi comes in. I quote from an article “Bound for Posterity” in The Telegraph in 2007, when the Folio Society was celebrating its 60th year: “Each book – the carefully selected typeface, acid-free paper, the stitching of signatures, the stunning design of the case and then the printing itself – is produced to a standard and not to a price. This is where the Folio Society and the Hereford Mappa Mundi, “that early map of the world” come together – the year 1,300 meeting today’s 2010 – where digital technology has been used to peel away the years' of wear and tear and discolouration to create a restored reproduction, as near to the most authentic version possible. The trustees of Hereford Cathedral, where the original Mappa Mundi resides, collaborated with the British Library and the Folio Society in producing only 1,000 facsimile copies of this wonderful masterpiece. The Folio Society's numbered copy will be displayed in all its glory beside the original in Hereford Cathedral for future generations to see – what an amazing exhibition to visit: to be able to see on the one hand the original that is seven hundred years old and the reproducion reflecting its original gilding, the blue pigment for the rivers, the green of the oceans, the red for the Red Sea!, as well as the clarity of the map as originally seen by pilgrims, nobles, philosophers and clergymen all those years ago. The original Hereford Mappa Mundi - to be found in Hereford Cathedral: ca 1300. So, at last, I come to the Mappa Mundi itself – one of the largest and most elaborate maps in Europe. The map, worked on vellum, embodies all The Middle Ages’ fundamental beliefs about the shape and nature of the world, which is drawn centred on Jerusalem; according to the old convention east is to the top. It is a bestiary, a psalter, a Bible, a history of the world and collection of travellers’ tales rolled into one – displayed for all to see on a carved oak triptych. It is a way of looking into the mind of the medieval age as it brings together so much – a compendium, an encyclopaedia of its day – all the glories, known and unknown, painstakingly put down on a single sheet of calf skin (five feet x four feet) – a cornucopia of mixed unfathomable messages. The Victorians could not get to grips with it – it did not fit their delineated world! ..... an artist to outline, another to define in ink and add colour, other artists to draw rivers, mountain ranges and the decorative foliage border. Finally, a professional limner added display lettering in gold in a beautiful Lombardic script. (Limner – Middle English .. Limnen – to illuminate a manuscript, with its roots in Latin – luminare – to illuminate, adorn). Isn't the difference quite extraoardinary .. even on these small pictures? This will be on my list of places to visit – to be able to see both Mappae Mundi in situ – to be able to look at the hundreds of inscriptions, the towns, the painted scenes and symbolic decorations .. to wonder at the rhinoceros, the unicorn, the skill of the Medieval peoples in devising this wonderful work of art. How I would love to own one ... as the Folio Society offer comes with two Commentary Volumes, bound in buckram, blocked in gold foil with Merida endpapers and ribbon markers and illustrated throughout – what a wonderful present – anyone? Only £745 – it counts as four volumes .. well worth it for this very curious map of the world - don't you think!? PS: They did mark Europe as Africa, and Africa as Europe .. but I guess that's 'easy to do' if you're just a scribe copying: and have no knowledge of the world. Here's a link to the video podcast showing some more of the detail - it's only 4 minutes & really does give you a better flavour than perhaps I've expressed here .. if you're interested have a quick break?! Dear Mr Postman – Things are definitely easier now that my mother can hear again and is taking a bit more interest and is cheerful. We’ve watched the tennis final at Queen’s Club at the weekend and today we saw the Queen driven down the Ascot Mile at the start of the Royal Ascot Horse Races being held this week. I have to say though .. I wish it would warm up! Fascinating! Sorry I can't gift you with one. I note the way we always try to make our world symmetrical and make sense -- the shape of a star -- rather than the random thing that it is. Very beautiful to have, yes. Such fine work. Leather bound, and gilt edged. Are you serious abut making the volumes your own? If I had them I would just sit on my sofa holding and revering them, perhaps never turn the delicate pages but once in a while. And will you try to navigate by the maps to Rome on your own? All roads lead there I have heard. Good to hear about Mom's hearing, Hilary. And I'm sending warm weather! Hope it reached you?? What a fantastic glimps into the minds of the ancients! Hilary, I can tell how much you appreciate this Mappa Mundi by how you have written this post. It is like an ode to the Mappa Mundi. There IS quite a difference between the two pictures. Amazing what they can do. You would be a wonderful caretaker should you ever come to own one of these. And why not! It JUST might happen. Hey, it's great that your mother can hear again, Hilary. So happy to read that. Hi Jannie .. isn’t it beautiful .. I’d love to have the map and the volumes .. but it’s wishing on a star! I really don’t know what I’d do with them if I owned them .. but it would be great to be able to have a good look at the volumes and the map ..
Actually I bet you could still navigate by the Itinerarium – as the Roman roads are probably still there! & per the map will lead to Rome?! Hi Davina .. yes you’re right .. I was totally absorbed with it and learning about the new version being produced – we’re so lucky with these technological advances .. that we can share in these developments and look back into history. You’re right isn’t there a difference between the two maps – wonderful they can reproduce that workmanship today .. craftsmen are so important. Thank you .. it would be lovely to have one .. and I can as you say definitely dream ..
Hi JD .. yes .. I'm not a very good craftsman .. despite coming from a family of that ilk. I'd love to be able to sculpt, draw, design .. and I love how others can do it. It's just so interesting how we were recording what we knew even in Babylonian times .. and as you say putting it so painstakingly onto the vellum. I've just added a PS to the post - because they did Africa and Europe muddled up ..
and a podcast video - which is really interesting to watch .. fascinating .. 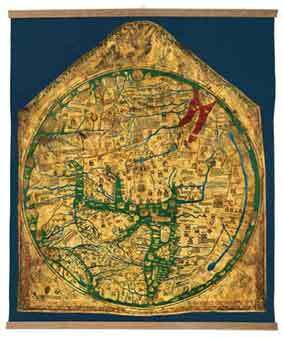 This Mappa Mundi from 1300 is most fascinating. How wonderful that the Folio Society has created quality prints. It must be fascinating to sit down and study the map in its meticulous detail. Blogger, be nice this time. You just ate my comment. Itinerarium -- you're making me Google again. I wonder how much bigger my brain is since starting to read your blog, Hilary? Yes -- cast off tomorrow!! May Day broken. Smiles tomorrow. Hi Paul .. I thought you'd be interested and appreciate the Folio Society reproduction .. I too would love to sit down and study it more closely .. but we need the two book-companions to understand the Anglo Norman & Latin scripts and decipher the illustrations I suspect! Hi Jannie .. sorry blogger chewed your comment .. but good you stuck around! Did you find Itinerarium .. I did put the transalation in .. I think?! .. written itinerary! .. well me too Jannie .. my brain is distinctly larger since all this started .. but I love it .. really stimulating and interesting. Yes - cast off day Thursday .. and lots of smiles and stiffness tomorrow .. oh well - Friday will be wonderful .. and a free weekend ..
i so gladd blooger did not eet my jannies kommint. and i hops it not eets my kommint eider. i iz happee to tel yoo i am good at chiseling and skulpting. Hilary -- This was a perfect topic for me today. Maps have always fascinated me, especially the early ones. "It is a bestiary, a psalter, a Bible, a history of the world and collection of travellers’ tales rolled into one – displayed for all to see on a carved oak triptych." This shows to me how people uniquely saw their world. In this case, it wasn't just getting from here to there...it was also a history. Hi Blue Bunny .. goods to zees U too. & bloggers helds UR kommint .. end uR Jannie’s ..
Ahh ahh .. well I tink JD wud likes to zee U .. as he’s nay gud at chisling & sculpting ..
Havs a gud day tomorrow .. and be cuddly to Kelly’s castless arms .. bye & see yooooo .. xxoo toos! Hi Paige .. not sure I’d wonder too much .. well there’s lots of good works being done .. but what will be remembered is another thing in 700 years time .. only 2710?? Will we know? Now that’s another interesting question ..
Hi Sara .. I have to say I’ve only recently become aware of maps and their meanings .. especially those of ages gone by. Really pleased that you were able to enjoy Mappa Mundi from my description .. it really is such a comprehensive coverage of the known world .. and as you so rightly say – how the peoples of England saw the world, or were able to ‘translate’ their understanding of it .. especially with the centre as Jerusalem – as this was made in England .. I just find fantastic .. they didn’t have photocopies to look at etc .. and it’s so relatively accurate. I have an award for you over at my blog (and I put you on my sidebar). Hi Hilary -- I know that these stories are meant on one level to entertain people close to you, and I also get that you have such a curiosity and love of knowledge that you'd be doing this no matter what! Hi Chris .. you're right - I started reading interesting articles to my mother and mixing and matching .. because she would ask me about some aspect .. so often I'd break my 'articles' into mind sized chunks .. so she could understand easily & not tire her out. Initially I have to say she had no problem with long articles - but I'd have a running commentary going at the same time .. explaining aspects .. making sure she'd taken in what I'd be talking about & asking her what she thought - getting her involved in a discussion .. and having lots of laughs. But you are right .. I have come to love this way of absorbing knowledge .. something I've only recently started doing - but I do love it .. so I'm here to stay! Another educational post! The look into ancient maps is fascinating! I have not heard about the Mappa Mundi. What an interesting map! Hi Evelyn .. thank you! Glad you found it fascinating .. and that I've enlightened you about the Mappa Mundi and other ancient maps. I guess your creative self will look at maps differently now? Something for the kids to do .. I love maps. And I also enjoy going to a new city, looking at a map of it and then making a game out of finding my way around. Your story of the old maps is absolutely fascinating. So much work went into creating what is now a work of art. It's good to learn your mom's hearing has improved. (((Hugs))) to you and her. Hi Barbara .. maps do hold this fascination don't they? I love the schematic maps that are produced for routes round crafts, or routes to vineyards and the Garden Route in South Africa .. & game parks .. then the illustrations come to the fore .. 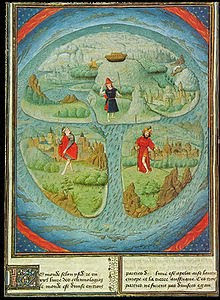 But the mappae mundi of old are amazingly creative visual reproductions of how they saw their world at that time. 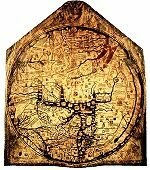 I was thrilled to see this tv programme bringing the Mappa Mundi to light and showing us its representations. Hi Jillian .. thank you .. it's funny how we think of people sort of randomly .. I often think of Cody .. perhaps it's his name and the little fella toddling around doing his thing! Great to see you .. and as long as you enjoy my stories that's all that counts and if they illuminate too even better .. thank you! My partner loves maps and that is exactly what we bring him as a stay at home present when we are away. I loved the Atlas focus on Sense and Sensibility (Austen) and how that grounded the family and the youngest child in their dire circumstances from their old life to their new. This was quite a study and lots of detail. I am glad I saved this post for my last read before lunch - I savored it with my salad. So pleased to hear your news about your mother's hearing - I would think that would make a profound difference - especially to her. Thank you for all your effort and good words. Maps change with evolution of the human mind, senses and spirit. Another point is that an encyclopedia is also sometimes viewed as a map to nowhere. That is to say, one perspective is that human beings often spend lifetimes learning recorded facts that are themselves in constant flux or forever changing. As you think or learn things, you come to realize theories change and perceptions shift or expand. What you consider believable or logical now may seem irrelevant or ridiculous at another point in perceived psychological time. Reflect on the history of any subject and notice how points of reference and authorities change for different reasons. In essence, some people feel they reach a stage where they begin selectively forgetting what is no longer believable or necessary. To return to a sense of nothing nowhere, now offers another perspective. I shall have to come back to read your blog more carefully. I've skimmed at the moment, but I think your blog is wonderful. Hi Patricia .. lots of people love maps – and I’ve always enjoyed reading our road maps and local lanes – fun seeing the contours, getting a feel of the terrain .. but never really thought about ancient maps. The Atlas in book form was a new thing in the late 1700s/1800s for the middle class to be able to own and look at – so no wonder the family took it as a reminder of their circumstances. Interesting point though and reminding us of those times. Thank you – always glad to hear you enjoyed it .. and that you savoured your lunch and had a good read at the same time – it’s really nice to know that the post and blog is worth it .. as such! Yes – Mum is definitely better – on the other hand asleep for both my visits yesterday – but we’ll get that more now. Having the tv on for these annual events – gives my Ma something different to do – she can’t do anything else .. but would hate to have the tv on all the time – we must be about the only room in the place that doesn’t!! Hi Liara .. maps change as our knowledge grows .. but as you say as we are able to create them in different ways. Your point about an encyclopedia .. is true .. a map or piece of information at that time is complete & only at that moment – is true .. life goes on and new things emerge or change. Hi Brenda .. that's really kind of you .. and delighted to meet you. I see you spent some time in Zimbabwe .. I only visited in 78 .. and lived down in SA for 14 years .. but then you went on to Australia. Map can be confusing at time and yet when we look at it closely, we can usually discover something interesting. On top of that, it provides very useful information. Glad to hear the positive news about your mother. Have a great weekend. Hi BK .. thanks for visiting .. as you say if we look closely enough there's always something of interest to relate to. Today's maps certainly provide useful information .. .. depending on the sort we're looking at .. Yes - it is good news that she's feeling better and certainly makes it easier. What I loved about this post is the discussion of the 'folio.' How I love books -- to the point that when I get an e-reader, it will be for convenience only. Holding a book in my hands, turning the pages -- especially of old tomes -- holds such fascination for me. It's good that museums protect such behind or under glass -- otherwise I'd have to touch. Old maps are equally fascinating -- for all the reasons you give here. We took our kids to see the cliff dwellings in Colorado years ago. Just one example of seeing into the mind and thoughts and beliefs of long-ago people. I do wonder what will be written about our own mind-sets and beliefs, our maps, our science and medicine, 600 years from now. Hi Barb .. thank you .. I’m glad my thoughts to bring ‘folio’ in has added to the post as far as you're concerned .. I agree – the e-reader may be useful .. but having that book in ones’ hands is special. Me too .. I’d be thumbing through the ancient scripts and that wouldn’t do them much good! I had a quick look at the Manitou cliff dwellings .. interesting recreation by the anthropologist – to preserve the concept of how the Indians lived then .. I wonder if the Indians wrote things down – they must have done .. did they have maps .. or was there so much space it wasn’t necessary til man and his population started to make things crowded? You’re right .. what will be written .. I hope we find out! I love maps. I created maps when I was a kid of real places and make-believe places too. Hi Southpaw . good to see you .. I wonder if I did .. I guess not - but it's the kind of thing a creative child would do .. so it must have been fun. Tolkein was really the first author I remember who had maps to explain the Hobbits' world .. You obviously loved drawing as well as maps for themselves. I love creating maps and reading about other maps that have so much detail. Whenever I'm writing my newest WiP I love to create a handbook and map to go along with it, because 9 times out of 10 it's a fantasy novel! Great blog! I look forward to visiting again! Hi Jen .. thanks for coming by - good to see you here. Well these ancient maps are quite extraordinary .. and their development -- I must do a follow up post I think! Interesting that you make a map .. mind-map style? .. and the handbook of notes .. how do you annotate the handbook - or categorise it .. or index it? Have a fun weekend .. dreaming away towards your goals ..
Lovely! Your post topic is interesting and fascinating. At the Podcast/video, I thought it interesting that Jerusalem was a the center of the map -- that one fact says a lot about the historical views of the times, no? You've got quite a lively crowd here, Hilary, keep up the great work. Hi Lori .. thanks for coming over - good to see you here. Glad you looked at the video-podcast .. I thought it was fascinating. The Medieval World centred on Christianity .. and faced East .. so yes - the world changed somewhat after that .. and continues to change to today. Yes Lori .. it's a great little gathering .. I'm very lucky .. and enjoying everyone's comments .. - so I will endeavour to keep everyone interested .. I'd hate to lose them! I loooove maps. A visual can say so much and what a map this is.The podcast was fun, thank you for the link. I must say though that I am pleased our world views have changed, hell and doom, no thanks. Hi Wilma .. sounds like a Dutch inheritance .. Mercator and on ... Glad you enjoyed the podcast .. that's good to hear. Life in the Middle Ages was certainly different ..that's for sure & hasn't our understanding changed so much .. again the Dutch to a great extent. It's certainly not very warm in the wind .. but it rained overnight here .. not during the day- that was something! I suspect it does feel like your winter ..
Just wanted to say that this post was most interesting! I'm something of a bibliophile myself so, as you can imagine, the quality of books that the Folio Society produces leaves my mouth watering (although I don't know why, one doesn't EAT books). Hi Tony .. thanks .. I saw you were going to come over after you’d had a good night’s sleep .. for some little light reading .. so excellent to see so many comments on previous posts – delighted! I know .. I love the look of the Folio Society books .. and these ancient books we hold in conserved perpetuity .. if that’s the right phrase .. in the museums .. I’d love to be able to see them – but can quite understand .. it’s not an option. But a good quality reproduction would be excellent too! Book worms eat books – but you’re a bibliophile .. a little different! Great to see you here & I’ll be over to see you shortly too .. and thank you .. that you approve of Sara’s recommendation .. she’s amazing with her photos and chatty story challenge .. I always have to go away and think! And aren’t the photos of her family great .. smart table, well polished & no dust!! If you have time and interest, here are three sites you might enjoy. Sacajawea -- one of my all-time-greatest historical heroes born a Shoshone in Idaho -- accompanied Lewis and Clark on their expedition throughout the Northwestern part of our country, in the very early 1800's. This site is from the Smithsonian (in D.C.) museum. If you click on "What are Winter Counts?" you will see some of the Sioux (Dakota) Indians' drawings -- their way of keeping records. The whole site is interesting, and not really that big. Hi Barbs will do .. later on today or tomorrow .. thank you very much .. I will enjoy them .. my uncle had a book on the north American Indians .. and it was one I wanted to get hold of .. but failed to do - I'll have to get another copy sometime .. Thanks so much for coming back to me .. I couldn't find an email address for you. I wanted to inquire about your mother. How is she and how are you managing? Hi Cheryl .. many thanks for asking .. she is very weak and definitely this last 6 months has knocked her .. but such is life .. she was very ill - but she's very strong and has come through - sleeping a lot more now. However she can hear .. I have to use prompts to help her remember .. but it's early days since her hearing came back. The most important thing is - we can say hello .. and I love you .. and she can smile and appreciate scented flowers .. Conversation as such will be out .. but exchanges and comfortable quietness together we can still have. Hillary: Wow. What a great post filled with interesting information. I have always found it fascinating to look at ancient artifacts and texts and distill messages and lessons from them. It is interesting to see that a lot of the information and universal truths they shared continue to hold true today and can point us to the truth within ourselves. Thanks for sharing this information. I really appreciated it. Hi Sibyl .. Many thanks .. great to see you here and so glad you enjoyed the post. That is so true isn't it - what is pertinent today was probably relevant aeons ago .. and as we learn more about ourselves we come to appreciate these universal truths. I must say that maps have always intrigued me probably because I am so navigationally challenged. I have maps hanging in a nautical bedroom in my house. I love thinking about the places on a map. Old maps do tell stories of yesteryear. Hi Teresa .. many thanks .. I love maps and can find my way round .. thank goodness! I love what you've done with your bedroom .. sounds a brilliant way of decorating the room .. I have two schematic maps of Game Parks hanging up .. which give a little story about what's going on in the area. As you so rightly say the older maps tell their stories. Wow Hilary that map looks amazing. I would love to see it and I think going to see the map would be a whole lot cheaper than buying the book. I love history. Rome is at the top of my must see places now but like most cities in Europe - it is ridiculously expensive. Thank God for Ryanair. I really don't like flying with them but they might help me to see Rome a lot sooner. Hi Cath - good to see you .. and hope all is well. You've got a point haven't you .. cheaper to go and look .. we could meet there sometime - it must be halfway or so between us?! I'd love to look through the books though with the map in front of me .. to understand it a little better. There certainly is so much to our ancestry and to the development of humans - what we know .. but it would be great to see Rome and have a good look round - and get a better understanding & go and visit Pompeii. Certainly the cheapy airlines offer good deals .. let's hope you can get there.